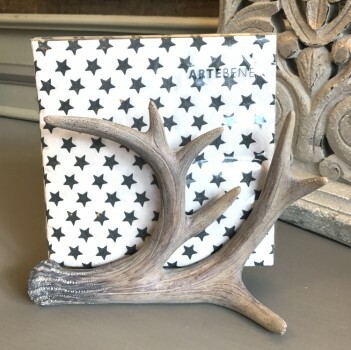 How great is this antler napkin holder. It holds a full pack of 25 napkins upright with space for a few more. Its made of a poly resin and is painted quite realistically to resemble antlers. We bought these for Christmas but we have put them out in the shop already and there is now only one left.